The last time I was in Germany I made the amateur mistake of forgetting to bring sufficiently English reading material. Conversational English was all well and good, Kirsten’s friends generally being fluent or at least competent by comparison to my German. However it lacked the verbal dexterity and linguistic extravagance which I inevitably crave. This time Frank Moorhouse’s book filled the role in style. 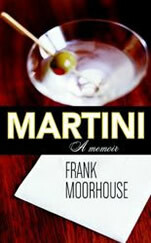 A memoir of sorts, it is told through an exploratory history of the martini and series of discussions and incidents from the author’s life which orbit the cocktail most deserving of the classic title. From time to time a writer in residence at King’s College, the opening scene is set in Cambridge — the bar at Browns restaurant to be precise. Much of the book unfolds through dialogue in similar settings, the extract above being a perfect example and the one that influenced me to buy the book in the first place, having opened it at random. Every element of the drink is covered from the alcohols involved to the glass to the garnish to the botanicals at work within, and always the author is able to weave a compelling tapestry between inconsequential facts about the martini and personal musings upon and insights into both the drink and life. Undoubtedly pretentious at times (as any memoir, itself the height of self-indulgent arrogance elevated to an art form, ought to be) and yet wonderfully rewarding with dozens of asides to slip into conversation at that next cocktail party. On an unrelated note I might point out that I have absolutely no opinion upon the new Transformers trailer. That major liberties were being taken with their appearance was already common knowledge, so one can hardly claim to be surprised at what one sees here. Evidence of substance remains at best veiled. I had a martini for the first time in my life the other night, because I thought it was time for me to broaden my alcoholic horizons. And let me tell you, it was the most foul thing I have ever ingested. It was worse than eggnog, and that’s saying a whole lot. I took one sip and thought, “that is not good.” On the second sip, I thought, “Oh, I’m going to vomit.” And promptly ordered something else. I don’t know how such a revolting drink got to be so damn popular and, as you say, “classic”. Ew. Never order cheap Martinis. They are, moreso than any other drink, terrible. In fact the Martini is the only drink I know of that waiters will sometimes recommend against you ordering because they don’t trust the barman. Yeah, but this was most certainly not a cheap Martini. This was in a fancy-shmancy restaurant (the kind that costs $80 for two people), and the waiter put this Martini in front of me like it was God’s gift to the earth. I almost felt bad telling him I didn’t like it. But then I wanted to vomit again, so no, I didn’t really feel all that bad.